My favourite Scottish castles - from picturesque towers to cliff top fortresses. As Storm Frank rages outside and hampers our efforts to explore, I’ve been reflecting on some of our 2015 adventures. Having a mega, history geek Mum means The Wee White Dug visits a lot of historic sites in a year. Thankfully he loves exploring Scottish castles and rushes around them at breakneck speed, sniffing out every nook and crannie. So, while Frank continues to blow a hoolie I thought I’d share some of my favourite Scottish castles of 2015. The photo below is of Dunnottar Castle by Stonehaven in Aberdeenshire. If you’re a Disney fan you’ll probably recognise it as the castle from Brave. Dunnottar is a dramatic medieval fortress, which sits perched on top of rugged cliffs near Stonehaven in Aberdeenshire. The site has been inhabited since Pictish times. On a lovely, blue sky day the best way to visit the castle is by following the coastal path from Stonehaven. The path winds along cliff tops, passing spectacular rock formations and lovely open countryside. Struggling for attention above behind a rather hairy Wee White Dug is Castle Stalker. The castle sits on a tidal islet in Loch Laich near Port Appin in the Scottish Highlands. If it looks familiar, maybe it’s because you’re a fan of the 1975 classic Monty Python and the Holy Grail? Stalker makes a brief appearance in the closing scene of the film as the Castle of Aaaaarrrrrrggghhh. Above is an ominous looking 15th century fortress known as Blackness Castle. Sitting on the shore of the Firth of Forth and resembling a huge boat from above, it’s often referred to as the ship that never sailed. It’s an atmospheric site which I find creepy and unsettling. Keen eyed Outlander fans amongst you may recognise Blackness as the filming location for Fort William in Season One. This is where poor Jamie is whipped by evil, arch villain Randall. Not far from this site stands the real life Lallybroch or Midhope Castle to give it its real name. My favourite castle of 2015 was Hermitage Castle, which stands in a remote spot in the Scottish Borders near Hawick. The castle’s origins can be traced to the 13th century. Hermitage Castle has had a very turbulent past, due to its important strategic location not far from the Auld Enemy (England). If those sinister, grey walls could talk they’d weave us a gruesome tale of bloodshed, battle and turmoil. If you look closely at the photo above,the castle looks like we’ve taken it by surprise as its sporting a startled looking face! Or is it just me who sees faces?! Next, we’ll visit a less terrifying location before we end up having nightmares. Sticking with the Scottish Borders let’s check out Smailholm Tower near Kelso. Smailholm Tower is a classic Scottish tower house, which was built in the 1400s. Loved by Sir Walter Scott, it’s survived the elements and centuries of border raids and attacks. It’s a beautiful and tranquil site, so it’s difficult to imagine it as anything other than the lovely, peaceful place that it is today. Smailholm Tower is hands down the prettiest historic site we visited this year. It really took my breath away. Next up, is Barnbougle Castle which looms majestically on the shore of Firth of Forth at Dalmeny. Barnbougle dates to the 13th century, but it was extensively restored in the 19th century. We pass it frequently on one of our favourite local walks. A mere stone throw from Edinburgh you can enjoy deserted beaches and wonderful views, but shhhhh don’t tell anyone as I’d like to keep it that way! Like all castles worth their salt, Barnbougle has a spooky legend attached to it. During the Crusades the castle’s occupant, Sir Roger Mowbray went off to fight in the Holy Land. Sir Roger was mortally wounded in battle and at that very same moment his faithful hound back home began to howl uncontrollably. It died of grief, pining for its dead master. There’s a spot near the castle named Hound Point. Legend has it that when the master of the household is about to breathe his last a ghostly hound can be heard howling. Some even claim to have seen it! I hope you’ve enjoyed our whistle stop tour around some of our favourite castles of 2015. I’ll leave you with a photo of Casper goofing around at Craigmillar Castle which is on the outskirts of Edinburgh. Craigmillar is a remarkably well preserved medieval ruin with links to Mary Queen of Scots, who once stayed there. 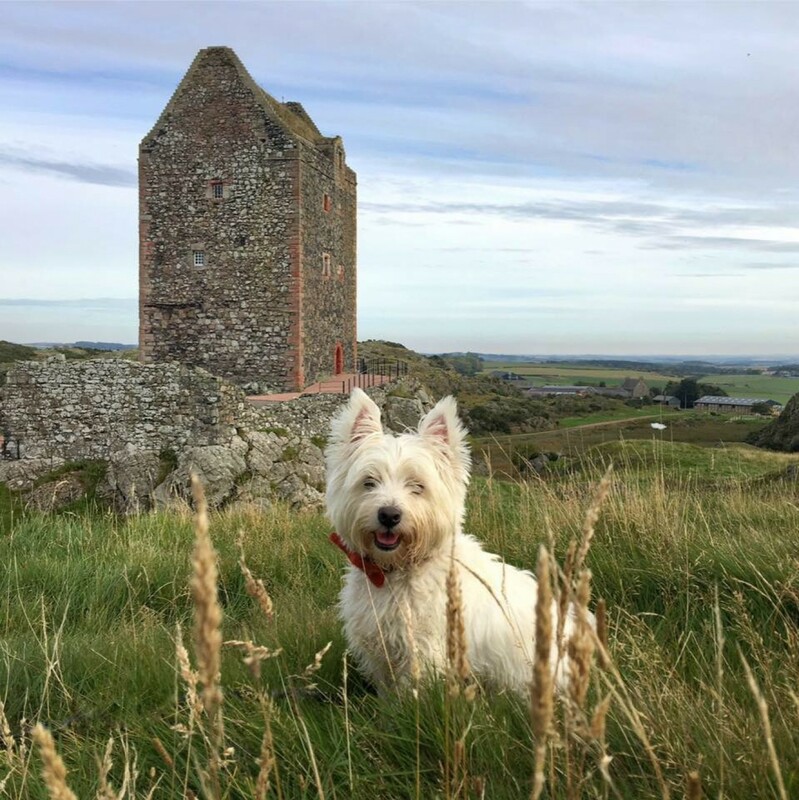 Casper and I will be back on the road and exploring Scotland again shortly, but in the meantime I hope you’ve enjoyed this whistle-spot tour of some of my favourites Scottish castles. Since I wrote this post back in 2015 I’ve gone on to visit many more Scottish castle with the boy. If you’re also a fan of castles here’s another post you may enjoy. Do you have a favourite Scottish castle too? Previous Away with the fairies on Doon Hill! Casper gives me the squees. Too adorable for actual words! That last photo of Casper is absolutely PRECIOUS! What a ham! Love these photos and the commentary. I’m loving these posts and your stories. Casper killed it in this one! Casper’s a very fine, gentleman companion for your journeys. Handsome fellow! Thank you and a Happy New Year to you too. Lovely, Westies are the best breed in the world! !